This is the journal of author and engineer Karl Gallagher. 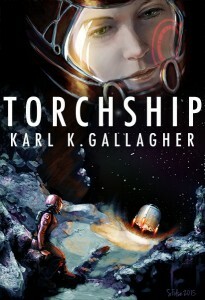 My novel Torchship is now available on Amazon, both ebook and paper. The audiobook edition will be available in March 2016. A captain who’ll take any job if there’s enough money in it. A pilot with an agenda of her own. And a mechanic with an eye on the pilot. The crew of the Fives Full are just trying to make enough money to keep themselves in the black while avoiding the attention of a government so paranoid it’s repealed Moore’s Law. They’re not looking for adventure in the stars . . . but they’re not going to back down just because something got in their way. If you're new here there's some posts I'd like to share. Requirements Kill: How projects can be ruined by the sheer number of requirements on them. Feeds, Seeds, and Gray Goo: Nanotechnological manufacturing will be driven by logistics--and that's what keeps the "gray goo" scenario from being a real danger. The issues with engineering as a career, the problems with engineering education, and how to become an engineer if you just can't resist it. The reasons to avoid government projects. Don't be this kind of whistleblower. Why licensing software engineers is a bad idea. Even in fiction it's hard to keep ahead of advancing technology. Analyzing specific spacecraft: Rocketplane's tourist design, the hypothetical Blackstar RLV, and off-equator space elevators. Medical doctrine: I have issues with the childhood vaccination schedule and the innumeracy of medical researchers. They're not all bad though. I've written a few pieces of fanfic and a whole bunch of book reviews. Playing MMOs has gotten me thinking about how we could use one to test changes to our real world and what would be the signs that we're actually living in a simulation. I've written a few things specifically about World of Warcraft. A rant on the brainpower needed for tanks to taunt mobs. A missing piece of backstory on the Defias. A suggestion for monetizing add-ons within the Blizzard rules. Reflections on how much more the Horde storyline focuses on PvP. And a discussion of how the Iliad would look in WoW terms. My opinions on war and politics have been given a blog of their own.